Today’s get-together at the Sanctuary for Independent Media is a precursor to a larger event tomorrow called interAct Troy!, a community driven skill share and party. It’s a great chance to check out the Sanctuary, visit friends up there, and promote the Allied Media Conference. There will also be the second round of the strategy session with Dee Dee Halleck, George Stoney, Michael Eisenmenger, and Steve Pierce, which is a not-to-be-missed combination of folks, especially if you care about New York and the future of public access television. The focus of today’s discussion is the “Omnibus Telecommunications Reform Act of 2007,” sponsored by State Assembly Member Richard Brodsky. The bill is a mammoth one that would have extensive impact on the lives of every single person in New York who uses the Internet, telephone, or television. This bill represents an interesting moment in the life of state franchising for video service. Last year, as you may recall, Verizon and AT&T spent tens of millions of dollars trying to pass national franchising legislation called the COPE bill through Congress. Simultaneously, they pushed similar legislation in a number of statehouses. The telcos’ goal was to smooth their entry into the TV market and they did not mind clear-cutting local media in the process. Many cities in Texas have already lost their public access channels as a result of the state franchising legislation there. While we do not believe state-level franchise legislation is necessary, we would support streamlining the franchise negotiation process by creating a strong, pro-consumer state agreement that could serve as a fall-back in instances where a local agreement cannot be reached in a reasonable period of time. The idea emerged from the unique circumstances in Philadelphia, where I was briefly the coordinator of the Philadelphia Grassroots Cable Coalition that included Penn PIRG and others. TV watchers in that town were suffering under a Comcast monopoly. The cable giant is based there and basically gets to write its own franchise agreement, with little oversight from the local government. It also controls all of the local sports programming, which it has historically used to its competitive advantage. (Much to the surprise of Free The Flyers followers, Verizon was able to ink a deal late last year for Philly sports programming on its FIOS system.) Philadelphia also has no active public access channels. Since the local franchising process was so clearly broken in Philadelphia, it would seem to make sense to seek redress in Harrisburg (where Verizon holds greater sway). The fact that CWA wants the state to require and to subsidize telecommunications deployment is no surprise. But the bill contains provisions for net neutrality, which CWA has previously opposed. Seems like the influence of the Local may have had something to do with that. Albany being Albany, there is no way to know what will happen to this bill (A03980 for those of you keeping score at home). Spitzer might try to kill it so he can push his own plan for broadband deployment in New York. Or telco lobbyists could try to rewrite the bill. The CWA and Brodsky, along with media reform organizations like Consumers Union, NYPIRG, Common Cause, and Free Press, will be holding a press conference to tout the bill in Albany on Tuesday, the 15th. Stay tuned here for my thoughts on that, a report on today’s meeting in Troy, and a breakdown of the bill itself. The FCC is holding a hearing in Harrisburg, PA, tomorrow, February 23, for a rare public hearing, certainly the only one in our area. It will be held at 9:00 am at the Whitaker Center for Science and the Arts at 222 Market Street in Harrisburg. More details from StopBigMedia.com. I got an email saying Media Tank, my former employer, is organizing a free bus to the hearing leaving at 6am from 30th Street Station. There’s no hint of it on their website, but if you want to reserve a spot, call Bryan at 215-563-1100. Unfortunately, I won’t be able to be there since I have to be up in NYC on Saturday for the Grassroots Media Conference. But I could not pass up a chance to make a little Free The Flyers hay, so I prepared some brief written comments, available after the jump. I also hit up the F2F list, now numbering around 300 irate Philly sports fans. I’m not sure what our best options for relief are at this point, but that’s not a group I’d want to get on the wrong side of. Bruce Schimmel, in his latest Loose Cannon column, dropped a bomb on Comcast. Apparently, Monopolia Comcasticus “has never met certain minority and women business goals” as required in its franchise agreement with the City of Philadelphia. The penalty for this violation, according to the article, should be about $4.4 million. Mind you, Comcast is still allocating its share of subcontracting money to local businesses, just not ones that are owned by women or African Americans. It’s not surprising that Comcast would so blatantly flout its agreement with the City or that the City wouldn’t confront the local behemoth. We’re still waiting for our public access channels. Councilman Nutter asked some pointed questions, including about Comcast’s fulfillment of its minority- and women-owned business requirements. Considering how intently Council focused on that issue with Earthlink, it was revealing to see how little they pressured Comcast on it. Apparently, this caught Bruce’s eye, as well, and he followed up on it doggedly, getting the data and crunching the numbers. It would be nice if the City would now get a payday out of it, but little chance with this administration. Bruce deserves some appreciation regardless. The way Bruce tells it, without Nutter, we’d still be speculating. So his article pushes me a bit towards Ruby Legs‘s positon in support of Nutter for Mayor, even while most of the other people I know in Philly are backing Fattah. A willingness to buck Comcast is pretty much the first thing I look for in a Philly politician. I understood what the Boston Wireless Task Force had proposed from reading Esme Vos’s post on it and reviewing the report. But Sascha Meinrath’s article really brought home how radically different the Boston approach is from, say, the Philadelphia approach. Philadelphia is letting a private company build a new “last mile” solution. City residents will have a lower-cost alternative, Earthlink, to the two wires currently connecting their homes to the Internet: the copper wires owned by Verizon or the cable wires owned by Comcast. This will have a profound effect on tens of thousands of households that will be getting online for the first time, but it will not fundamentally change our relationship to our communications infrastructure. Boston sees the new network a little differently. Their proposal imagines it as a neutral platform connecting all of the people in the city to each other, like the streets. The business model is designed to sustain that interconnectedness, allowing users, small businesses, non-profits, and big businesses to offer services that capitalize on it. 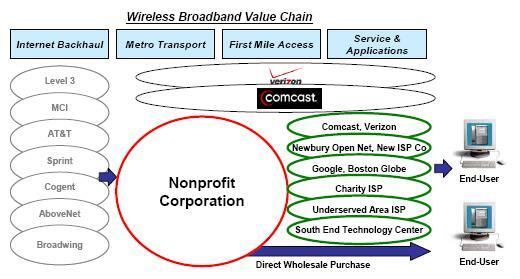 Here’s the Boston diagram to express how the nonprofit-owned, open access, neutral network results in more services, applications, and Internet options for the end user. They even label what is normally called the last mile – the portion of the network that connects your home to the trunk cables running to your neighborhood or street – the first mile, recognizing that content starts at the home. The second diagram also shows how the Boston model undermines the current duopoly. As with the Internet, the wires or wireless connections only become valuable when we do something with them. I expect people in Philadelphia will be surprised at the range of applications that will become possible once the wireless network is in place. Unfortunately, the innovation and experimentation that will incubate those applications may wind up taking place in Boston. Looks like Catholic sports fans are getting it from both ends. Last week, Comcast bumped the Catholic channel, which among other things broadcasts mass to shut-ins and the elderly, off of its basic tier and up to the more expensive digital tier. As with Comcast SportsNet, the cable giant is using must-have content to squeeze dollars out of its subscribers. Sadly, at the end of my two-week run as the Philly Future Featured Blog, only 13 new people have signed onto Free The Flyers. Worse still, the Nationals have taken away the best reason for us all to meet up at a sports bar. But there are 263 of us, so we should do something. Last week, I talked about the state franchising bill currently on the table in Harrisburg. Word is, the bill is stalled and might not make it through this session. The sticking point is “buildout,” with Verizon wanting to be able to choose where it builds and municipalities and consumer advocates wanting requirements to provide service to the rich and poor, urban and rural alike. Verizon is still pushing like heck, though, so phone calls from constituents continue to be important and useful. Prometheus Radio Project, usually focused on issues of radio rather than TV, is hosting a page that explains who to call and what to say about Senate Bill 1247 / House Bill 2880. Pondering how one might begin to compete with Comcast in Philadelphia, last week I ended a “meditation” with an imagined scenario in which News Corp purchased Earthlink. I don’t want anyone to think I see that as any sort of fundamental solution. Choosing between a bundled wireless partnership and a monopolistic or even duopolistic triple play is not a choice that transforms our relationship to our communications infrastructure, at least not the way community ownership or even true open access does. But any competition would weaken Comcast and thereby strengthen other strategies for addressing its monopoly. In fact, there are provisions in the contract Wireless Philadelphia negotiated with Earthlink that would give our city some protection in the event of a buyout. Minneapolis, on the other hand, just signed a deal with a local Internet builder that needs a large up-front payment from its anchor tenant, the City itself, to afford the construction. Becca Vargo Daggett points out in her response to the contract that US Internet must seem like low hanging fruit to an AT&T just entering the wi-fi market or to the rapidly-expanding Earthlink. The contract offers no protection against a change in ownership. As I promised on Monday, my first article on GovTech’s Digital Communities site went up to today. Philadelpha plays prominently in the article. Check it out. The article is a much-expanded version of something I posted to this blog last month. I’m very excited. My next article will be about the way cities, including Philadelphia, are planning to spend their new “digital inclusion” revenue.